Sabrina and Logan are on the road again! This weekend they are visiting Knitique in Elk Grove, CA for two RSVP only events - Friday night from 5 - 7 pm and Saturday afternoon from 12 - 3 pm. Be sure to call (916) 714-7719 right away to reserve your spot, and read on for more about Knitique! When was the shop founded? 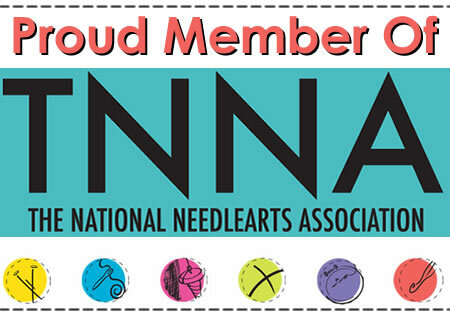 Knitique was founded in June 2005. After Danielle's husband's military deployment in 2003, where a local yarn boutique saved her sanity, she decided when she moved back home she was going to open her own yarn boutique. Tell us about you and your employees! Danielle is the owner of Knitique and a Knitter Extraordinaire! This girl can knit anything! She travels the world keeping up with all the latest trends, yarns, and products, and brings them to the shop. You can meet all of the Knitique girls on the website - scroll down! Tell us about your shop in five words or phrases! Fabulous yarn, Friendly Service, Fun Classes, Large selection of yarns made in the USA, and Our own line of patterns. We are lucky to help people that participate in all different crafts. Knitters, both hand and machine (flat bed and vintage sock machine), Crocheters, Weavers. Spinning isn't my expertise but luckily Susan, one of the Knitique Girls, offers private lessons in this craft. Do you offer classes or other programs? We are the largest teaching shop in our area, usually teaching 2-3 classes each day. We love hosting events. This year along with amazing trunk shows we have Laura Nelkin coming to teach at Knitique. Yarnover Truck will be coming up from Los Angeles and will be parked in front of the store. We do lots of knitalongs and other special events, too. This year, Danielle has planned a year long event for the Chinese New Year, "The Year of the Sheep." An original design will be available, along with yarns dyed in the USA. Prizes will be given out each month and one lucky participant will win a sweater's worth of yarn. How long have you carried Anzula? What made you pick us up? We've carried Anzula for as long as I can remember. We have quite a loyal following and it tends to sell rather quickly. I picked up the line because of Sabrina. I love her vivacious personality and wanted to help support a business that is woman-run, American, and even California-based! What lines do you carry? We carry For Better Or Worsted, Nebula, Wash My Lace and Squishy. The yarn sells fast so if we don't have what you need, we would love to special order any base, any color and any quantity. Do you sell online? Does your shop use social media? We don't technically have an online store, but we sell and ship daily to all around the country. If you see something you like on our Facebook page, webpage, or one of our emails, just give us a call at (916) 714-7719 and we will pop it in the mail for you. We love social media; you can find us on Facebook, Pinterest, Ravelry, and we've just started up Instagram! So if you haven't RSVP-ed for one of the Anzula events at Knitique yet, hop on your phone and give the Knitique Girls a call! They will be taking special orders all weekend. Can't be in Elk Grove? Tour the shop online and call your special order in!